Since the Head Gardener's return from her April 1st adventure, she has been a stern taskmaster indeed, proving that my title of She Who Must Be Obeyed is nominal at best. The continuing combination of drought and high temperatures, augmented by wind gusts up to 20 mph, has taken a severe toll on my corner of Katy. 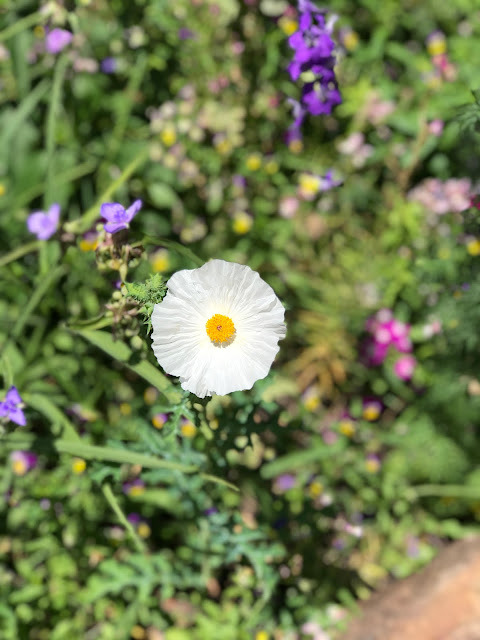 Having previously decreed that the poppies be removed, she then turned her attention to the rapidly declining toadflax, larkspur and violas. She recommended (nay, demanded) that as we removed those spent plants and a few unwelcome weeds, we also work on gently loosening the parched and nutrient-deficient soil. Our tool of choice for these arduous and time-consuming tasks was our trusty Cobrahead® Weeder and Cultivator, the invention of Noel Valdes. I purchased my first Cobrahead from Noel's son Geoff at a farmer's market in the parking lot of Austin's Wheatsville Co-op way back in 2002 when they first started marketing their product. 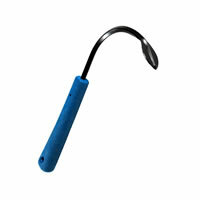 I'm proud to say I was one of the first gardeners to use the Cobrahead® . That first Cobrahead® is still in regular use and as I posted last summer, it has been joined by two others. My Cobrahead made the daunting task of cultivating my depleted soil much easier and as I worked, I thought about how grateful I was to have such an excellent tool at hand and how I wished more gardeners had the opportunity to use one. The Head Gardener suggested that perhaps the folks at Cobrahead® would be willing to provide one for me to give away on this blog. I e-mailed Noel and he most graciously agreed. All you have to do to be the lucky recipient is leave a comment on this post. I'll pick a winner on Friday, May 6th. This is my first ever giveaway and I'm very grateful to the Cobrahead® folks for making it possible! I have one so no giveaway necessary here but let me add my praise to yours concerning this little tool which does so much with little effort. Dandelions...begone! Cindy, I already have one, so don't enter me in the contest. I want others to have a chance to get one of these indispensable tools. Whenever I work in the yard, I usually just walk around with my kneepad, trimemrs and Cobrahead. I dig holes, clear weeds, fluff dirt, everything! Wow, I don't have one of these, but you sure do make me want one. I enjoy your blog. I've been reading for about a year now. I just completed building a potager and could really use one of these! I love mine too...so don't need to be in the drawing. Just want to add my comment about what a great tool it is for so many things in the garden. They make great gifts too! I'm perplexed by anything other than a trowel, so if I win you'll have to teach me how to use it. I don't have one and would love it! I always love info on a new gardening tool! My newest love is my fiskar pruners! I'd love to have one! I've just started investing in quality tools and have only a couple that I think will stay with me for years. The cobrahead would be a great addition! Love your corner! Looks like the perfect thing to root out that nut grass! It is so great to have people with "connections". I don't have one but would even be interested in seeing a demonstration. It looks too simple to be so useful. I can sure use a weeder. I have a bent piece of metal that I use on a wooden stick. Isn't that sad? Thanks for a fun opportunity. Can you post a RAINfall giveaway soon? I'll sign up a hundred times in a row...one for each day we haven't had rain. If I win, I promise to do a rain dance every day until we get caught up....this is getting sad. This handy tool sure will help in my veggie garden. I have one Cindy, but if I win, I'll give it the young couple that love gardening and just moved in two doors down. She'll love it. I have one and liked it so much I got one for my mother but I'd sure like to be able to give one to my brother-in-law. He's new to gardening but loves it and is getting his kids involved, even if they sometimes pull out the good stuff as well as the weeds. Many thanks to all for entering! I'll announce the winner tomorrow morning!